While 7% of the Chinese smartphone market may seem like nothing to get excited about (especially considering Android had a staggering 68.4% last time we checked), it is an impressive statistic if you take into account that two months ago, not a single WP-powered device was for sale in China. Growth of this speed has only been seen in one other market so far: Nokia's backyard of Finland. Reports also indicate that WP is gaining traction in Russia too. 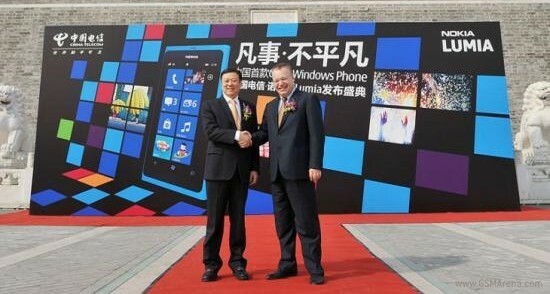 Furthermore, Michel van der Bel, COO of Greater China Region for Microsoft, claims that the campaign in China is only just getting started, with Microsoft having deployed a 2,500 person R&D team to focus exclusively on the Asian market. We do take the explosive growth figure with a grain of salt, however, since there are hints that the original source may have misinterpreted the statistics to mean the entire market, as opposed to just one operator. For now, though, it seems that WP is getting some major love in China. I suggest you read this article http://m.gsmarena.com/nokia_drops_support_for_sk­ype_app_on_the_lumia_610-news-4284.php And Skype also means Voice and Video Calling. agreed it is underated and the NOKIA apps are great. i'm just unsure that the app's and pricing match that of apple and android.... But as an OS it is fantastic on my HTC HD2 windows worked like a treat and that was before MANGO was launched.